Chewing betel buts is part of the Assamese culture. And, when it comes to munching a premium 160 zarda mitha patta paan, it is lavishness for many in Guwahati. As cold winter is all set to engulf the largest city of the northeast, the paan chewers are caught in a state of total disquiet. Suddenly the green betel leaf has disappeared from the market. Most of the paan shops in Guwahati since Sunday could not sell their signature products of paan. “How can I sell pan to you when I don’t have any green leaves?” Raghubir Pundit, owner of one of the premium paan shops in Rukminigaon, said. Some are selling their paan at a higher rate. Price of mitha patta 120 zarda has been hiked from Rs 10 to Rs 15, while 160 zarda paan is being sold for Rs 25. “We have no choice,” Pundit said. 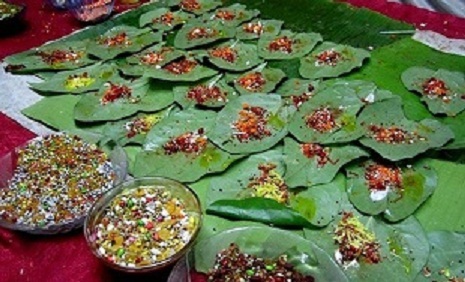 None of the paan shop owners actually knew the actual reasons for the disappearing betel leaves from the Guwahati market. Some said there is some problem with the producers in East Midnapore district of Bengal. For others, the reason was different – some problem with the supply chain. But, most of the paan shop owners in Guwahati knew about a week ago that soon there may be some kind of scarcity of green leaves in the market. “But, we never expected that the problem will grow so big,” Nandan Jha, a shop owner in Fancy Bazar, said. Surprisingly, none of the government agencies, including the Guwahati Municipal Corporation (GMC) tried to look into the issue. “Nehi malum sarkar keya kar raha hein,” Nandan Kumar, another paanwala in Chandmari, said.